Angels Light Therapy is angelic energy that assists in transcending all issues bringing you in balance with the Creator and your innate spirit. Allowing you to tap into the angel energy within. Waking you from the dream so you can remember why you are here. This has evolved from Angel Therapy as the Angels have taken me to another level with Angelic Atunements, that have been given to me to enhance my work with energy that comes through my palms enabling me to tune in even more with clients with the laying on of hands. This has changed my life. Angels Light Therapy is a non-denominational spiritual method that involves working with a person’s guardian angel’s and arch angels,to heal and harmonize every aspect of life. Angels Light Therapy also helps you to more clearly receive Divine Guidance from the Creator and the angels. We are surrounded by etheric beings that want to help you. Not only do they want to help, it's their purpose for being. Everyone has guardian angels, and these angels perform God’s will of peace for us all. 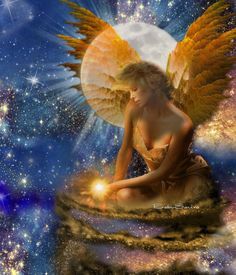 When we open ourselves to hear our angels messages every aspect of our lives can change for the better, because you’re reminded that you are connected to the Source. Angels Light Therapy session can consist of a reading, balancing the body temples energy, crystal healing with chakra clearing and pulling of etheric cords along with laying on of hands energy. Also during this session I can teach you how to connect with your angels on your own. is the next level to heal with the energy of angels. IET uses a divine angelic energy ray to work directly with your 12-Strand Spiritual DNA. IET supports you in safely and gently releasing limiting energy patterns of your past, empowering and balancing your life in the present, allows you to reach for the stars as you evolve into your future with happiness. Feelings and sensations are stored in the cells of the body much like facts are stored in the cells of the brain. Negative or traumatic experiences, stress, unexpressed emotion, fear, anger, resentment or self-limiting beliefs can become "stuck" or suppressed in the body and inhibit or disrupt the flow of vital life force at the cellular level. These energy blockages limit our experience of life and can result in a lack of spontaneity, energy depletion, a feeling of unrest, agitation or dis-ease. IET uses a unique Cellular Memory Map to target specific areas in the body where these "cellular memories" are stored, helping to release them on all levels - physical, emotional, mental and spiritual. As these blocks are cleared, the suppressed charge of energy dissipates and your energy field is re-balanced. The more your energy body opens and vital force can flow freely through it, the closer you move to a natural state of being: Pure Joy! This video shows the energy fields that occur as I work on my client with Angels Light Therapy. During the reading as I commune with the Creator and with the Angels I'm using Energy Healing (RPT or Theta Healing) to remove and clear any issues surrounding any blocks that may come up during the reading. As a result, you will leave with a deep sense of peace and balance and a clear understanding of what steps to take and which angels to call upon when needed. I've known Regine for many years and have been blessed to experience her wonderful healing sessions. With her assistance and that of her angels, I have gone from an unemployed almost homeless person to a life that's thriving with a very good job that I like and a stable home that I've lived in for many years. Her healing hands and techniques have helped me get rid of old stuck energy, habits, phobias and depression. I recently had another healing session and I could literally feel the old gunk being sucked out of me. She used crystals and afterwards, I felt relieved and a sense of peace. Regine is also very intuitive and she gave me some wonderful news. I am anxiously anticipating the gifts that she relayed. If you fail to keep your scheduled appointment without an advance 24 hour courtesy call, a cancellation fee of half of the session will apply.